Since we’ve been talking about different kinds of fabric, we thought it would be helpful to put together a little list of fabric terms. You’ve probably heard these words before and may even know all of them. If so, consider this a little refresher! Drape refers to the way a fabric hangs away from the body. For example, silk chiffon has flowing drape that seems to almost stick to itself. Compare this to silk organza which is also thin yet it has a stiff drape and sticks away from itself. Fashion fabric is specifically a home sewing term. It’s used to only describe the fabric used for the outer portion of your garment, so you wouldn’t call lining fashion fabric. Grain is one of the most important aspects of fabric. A grain line runs parallel to the selvage. Grain lines are marked on pattern pieces so that they can be aligned with the fabric’s grain. Cutting fabric on grain allows your final garment to drape correctly. The cross grain runs perpendicular to the selvage. Many garments are also cut on the bias. The bias runs 45 degrees across the grain and is very stretchy. Hand simply describes the way fabric feels. Boucle has a bumpy hand whereas sueded silk has a soft hand. Knit fabric is knitted on complex machines. The fabric is usually quite stretchy and comes in a wide variety of materials. Lining refers to the fabric used exclusively on the inside of a garment. All garments can be lined but the most common are skirts, jackets, coats and dresses. Nap and pile are interchangeable terms describing the same thing. Velvet and corduroy are two fabrics with a slightly fuzzy pile. If you run your hand across the fabric, you can see that the pile changes direction. It’s very important that the direction of the nap be the same every time you cut out a piece of fabric. This ensures that your garment will look uniform. The right side of the fabric refers to the side of the fabric which is intended for the outer side of the garment. The wrong side is the opposite. However, some fabrics are indistinguishable on both sides and so there is no wrong side. 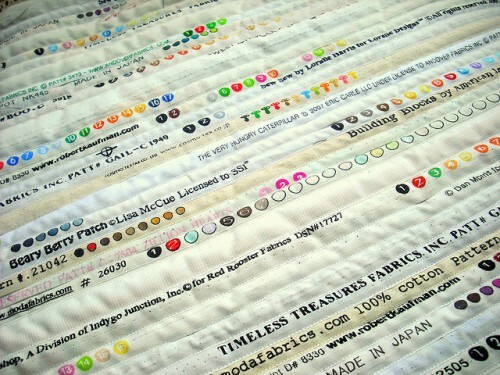 Self fabric is a professional sewing term that means the same thing as fashion fabric. Selvage is the edge of the fabric that runs parallel to the grain line. Usually the selvage won’t fray and is marked with information from the manufacturer. Warp refers to the threads of a woven garment that are parallel to the selvage. It’s the same as the grain line. Weft refers to the threads of a woven garment that are perpendicular to the selvage. It’s the same as the cross grain. Woven fabrics come in many different styles and are created on looms. They have a warp and weft. In general, woven fabrics don’t stretch unless they contain a material that stretches, such as lycra. Thanks so much for this. As someone who is new to sewing, this is very useful and simply explained. 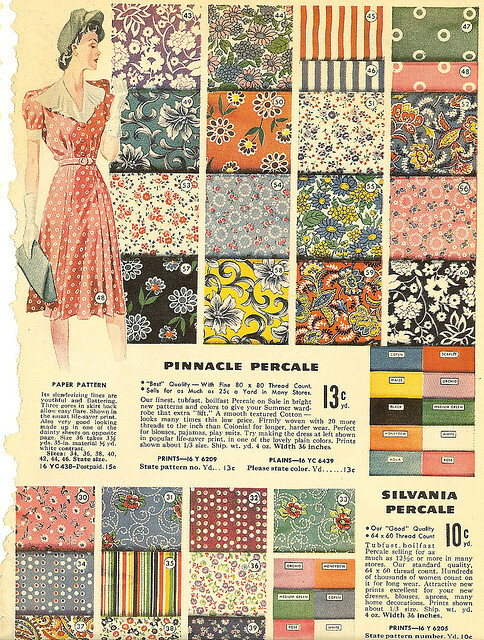 Okay, since the first pic is a vintage page straight out of an old catalog…what’s percale? And where can I get buy that today? If you do a search (Google or Yahoo) for “percale yardage”, there are several shopping options that come up. I’m so happy that you’re doing this. I’ve been sewing for years but I’m mostly self taught so I’m still stumped by terms every day. I have seen so many people to creative things with selvage edges. I need to get my thinking cap on and come up with my own ideas! I love your photos! Imagine fabric at 10 cents a yard. And they are so pretty. Thanks for the information and thanks for the copy of that advertisement, hard to believe that fabric was so cheap. Thanks! My English is not so good and especially knowledge of sewing terms. It is very useful post! wow there’s no way i can find great prints like that locally…those are fantastic! Just came across this post in a link from today’s blog. It wasn’t until I read this that I realised that here in Australia & in the UK we spell selvage, selvedge. I had to go & check I hadn’t been spelling it wrong for years. I always remembered what it was by thinking of it as sellers edge sel-v-edge. At to cheap fabric, the best price metreage was the white cotton lawn I bought in 1985 for 20c. I wanted to make my debutant dress to a) save money & b) challenge my 16 year old sewing skills. I chose a Laura Ashley pattern that required 8m plus about 12m of lace. The lace was brodierie anglaise trim was 20c & 80c per metre. I travelled across Melbourne, on public transport, by myself to go to Forges of Footscray for my bargain purchase. At the time this fabric would have been $1.39 a metre, so it was worth the effort. My dress & hoop petticoat cost less than $40, my shoes $14 & my lingerie about $16. Most girls spent more than $100 on their dress alone. I was so proud of my achievement. Prices at $.13 yrd was when people use to earn less than $10.00 per day, I’m fairly certain. Thank you so very much for all your hard work doing all these blog’s, they are most informative and extremely appreciated. Keep up the great work, and please keep them coming. I learn more from your site than a lot of sewing shows on TV. I also love wearing dresses rather than any other kind of clothing, it is mostly because of the comfort and ease of dressing, and top it off I feel most pretty when wearing a dress. I know it is not popular where I live, yet I don’t fit into a square peg anyways. I have a hiatal hernia that always protrudes and is problematic, wearing a dress helps me be much more comfortable. God Bless and thank you again for all your diligence and hard work.